Aretha Franklin showed she had an eye for top talent at the Thelonious Monk International Jazz Piano Competition. 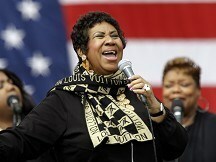 The 69-year-old soul star attended the finals in Washington, DC at the weekend and the New York Post reports her manager approached one finalist, Juilliard masters student Kris Bowers, and told him: "Miss Franklin would like to speak to you." A source revealed: "She told him she would like him to be her piano player from now on. Kris ended up winning the whole competition, so Aretha knows how to pick 'em." The Grammy-award winning Respect singer, who released her first single in 1960 aged 18, underwent surgery for an undisclosed ailment in December but is still touring and released a new album in May. Sir Paul McCartney could marry for the third time at the same location he tied the knot with first wife Linda. Nineties hits Common People and Movin' On Up are up against songs by Jessie J and Ed Sheeran as the festival anthem of the summer. The Wanted and Jessie J are set to perform at T4 Stars of 2011.Wretch 32 and Professor Green will also be performing at the Earls Court show, on Sunday December 11. Singer Kelis has accused Britain of being "racially decades behind progression" after she was allegedly subjected to abuse at an airport because of her skin colour. Annie Lennox made an exhibition of herself today - as she launched a new display at the V&A Museum from her personal archive. The Rolling Stones have not been asked to play at the 2012 London Olympics, according to lead singer Mick Jagger.